# In this post, i want to share some tips for those who love to save web-pages for their research or with a hope that they might need this web page for later reading purpose. # You can also save any web page in PDF format, but i think this way is not best, because i really hate to edit PDF files, actually it's boring to extract content from a PDF document. but if you are working with a *.mhtml or *.maff file, this gives you many features to customize them and more interactive than PDF documents. # The best way that i found, is that save your web-page as a single web_page_archive file, and if you are thinking why should i save my web page as a single web page archive file. # Answer is quite simple, because you can manage that file easily rather that managing a html file along with a folder which contains file necessary for your html document. # if you save a webpage as a web page archive than you can open this with google chrome or internet explorer, without any addon, but if you are a firefox user that you have to download a addon for firefox which allow you to save a web page as mhtml and allows you to read mhtml file. # google_chrome and its relatives. >>> type 'chrome://flags' in chrome URL tab. >>> you are now able to read and write mhtml files. you have to download and install this addon, from this website. 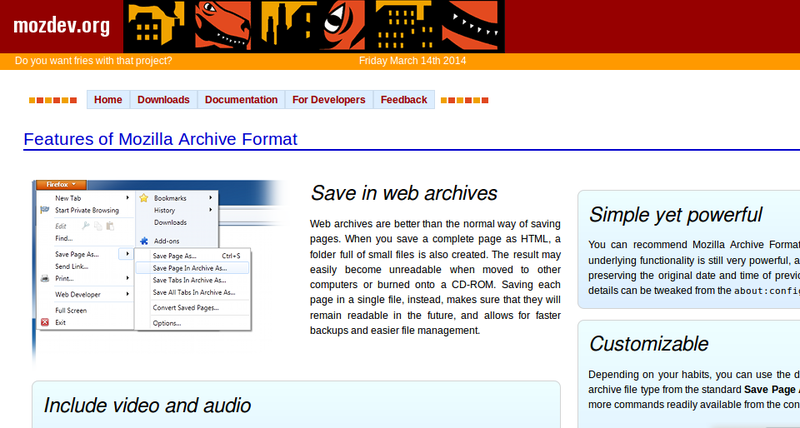 this firefox addon allow you to save a web page in many formats, such as mhtml, maff, and other formats. # link to original web page. # include everything in a single archive to display a full web page. # a lot of features to play with them, i also love this addon.